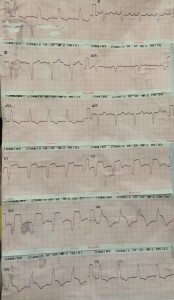 ECG #8 More chest pain! What is the diagnosis and what criteria did you use to confirm? 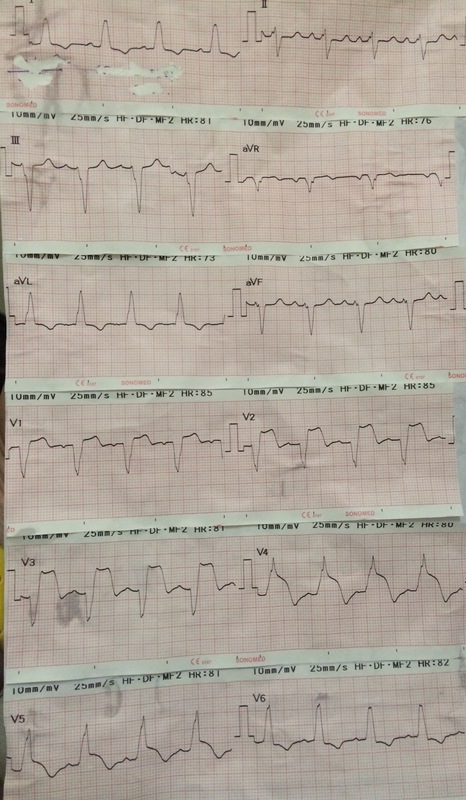 So this is a Left Bundle Branch Block with signs of anterior STEMI. The practical take home message for LBBB is that ST segments and TWs always go in the opposite direction to the main QRS forces. Thus by these simple rules , the lateral leads here are abnormal and thus ischaemic…there are dominant R waves in V4 and V5 associated with ST elevation, not depression, thus this is a STEMI. There are of course more scientific ways to determine STEMI in LBBB. “new” LBBB is rarely new and uncommonly associated with acute CA occlusion (2.4%) thus now not in guidelines. 3. at least 1 mm of discordant ST elevation AND an ST elevation to S-wave ratio of at least 25% in at least one lead.